A moist and delicious chai-spiced cake layered with fluffy and subtly sweet swiss meringue buttercream, fresh figs, and caramel! All free of gluten and refined sugar! It’s finally fig season! Although I don’t have a tree in my backyard 😩 they’ve been making their way into our local grocery stores (albeit for a pretty penny). As their season is so short, I’m taking advantage of this unique and delicious fruit while I can! I finally found a delicious frosting that isn’t choked full of powdered sugar! I’m normally not a big frosting fan because it’s usually too sickeningly sweet for me, but this buttercream is subtly sweet, yet still creamy and fluffy, like a good buttercream should be. It’s only sweetened with honey and maple syrup too! I use a combo of each so that the buttercream doesn’t have too strong a flavor of either honey or maple syrup. Aside from the butter in this buttercream, the cake is free of dairy. You can use my simple 2-ingredient frosting recipe if you’re looking for a dairy-free version. The salted caramel is a yummy addition! It’s also simple to make and free of refined sugars. If you’re a caramel fan, you may want to go ahead and double the recipe so you’ll have extra to drizzle over each slice—ah, it’s soooo good! This cake has a delicious combo of flavors and is a perfect way to use up those delicious figs. The warm spices are a lovely addition too, especially with fall right around the corner! Be sure to tag me and #wifemamafoodie on Instagram if you make this cake! Love seeing what you’re whipping up in the kitchen! 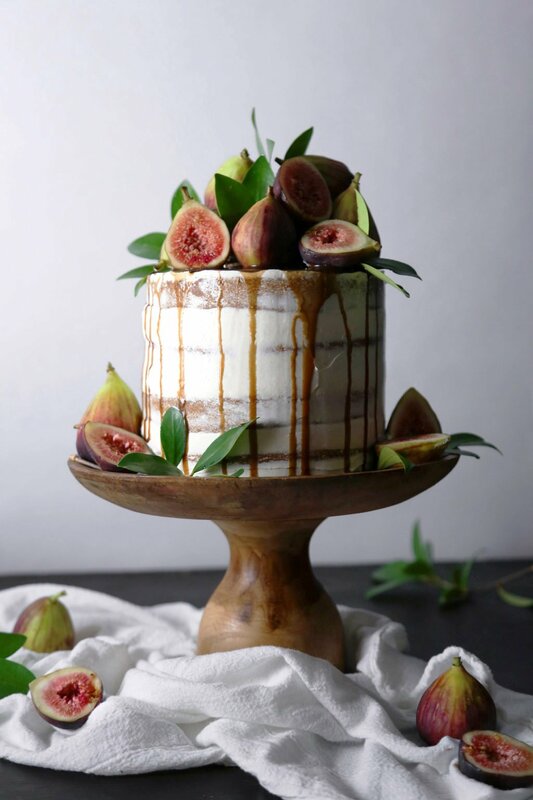 A moist and delicious chai spiced cake layered with swiss meringue buttercream, fresh figs, and caramel! All free of gluten and refined sugar! Preheat oven to 350F. Grease two 8-inch round cake pans or two or four 6-inch cake pans and line the bottom of each with a round of parchment paper. Set aside. *I have only two 6-inch pans but I do two batches to make 4 thinner layers and avoid having to slice a thicker cake in half later. Combine flours, spices, baking powder, and salt in a large mixing bowl. Slowly mix in milk, maple syrup/honey, coconut oil/butter, eggs, and vanilla. Mix for 2-3 minutes, until smooth. Evenly divide the cake batter into each pan and place into the middle rack of the preheated oven. Bake for 18-25 minutes (depending on pan), or until center is set and toothpick comes out with only a few moist crumbs. Stir together egg whites and maple syrup/honey in a medium heat-safe bowl. Place over a pot of boiling water, stirring often until mixture reaches 150-160F degrees on a candy thermometer (about 5 minutes). Make sure your mixing bowl is clean and has no grease or butter residue, which can keep the egg whites from fluffing up. Pour the heated egg/syrup mixture into your mixing bowl and beat on high speed for 6-8 minutes, until fluffy and stiff peaks form (use a wire whisk attachment if you have one). Switch to your paddle attachment and begin adding butter slowly. Beat the buttercream on medium-high speed until fluffy. If mixture gets too warm, place into the refrigerator for 20-30 minutes to chill and then beat again. Place butter/coconut oil, coconut sugar, and maple syrup into a small sauce pan and place over medium-low heat. Stir often until sugar begins to dissolve and mixture thickens slightly and begins to bubble. Add vanilla extract and salt, stirring well. If caramel gets too thick, you can stir in a little milk. Add only a little because too much milk will make it too liquidy. Keep in mind that caramel will thicken as it cools so make this close to the end. If caramel cools and gets too thick, you can place it into the microwave for a few seconds to make it a drizzle-able again. Begin layering cake. If you made two thicker cake layers, you can carefully cut them evenly in half lengthwise to make more layers. Place the first layer of cake onto your cake plate and top with a large dollop of buttercream. Spread evenly across the top and repeat with remaining layers. Use a large offset spatula to frost the top and sides of the cake with a "crumb coat". Drizzle some of the caramel over the top, saving some to drizzle onto each serving. Place figs on top of the cake, cutting a few in half to add color. You can also add greenery or flowers, if you like. To serve, drizzle each slice with more caramel and top with fresh fig slices. Makes 10-12 servings. Store leftovers in an airtight container in a cool room for 1-2 days or in the fridge for longer. Keep in mind, the cake texture becomes a little more firm when refrigerated (possibly from the rice flour) so it's best eaten fresh or within a day of sitting at room temperature. *I've seen recipes that used all vegetable shortening in place of the butter to make it dairy-free, but I haven't tested it myself. Keep in mind it would have little to no flavor if using shortening. I was looking for a no-sugar buttercream recipe and luckily found your web! Love it! I am definitely baking this cake, this is exactly what I was looking for! Thanks for sharing, it really looks amazing! Thank you for the kind words, Almudena! I hope you enjoy the cake. Have a lovely week! Hi Em! Thank you! How nice it must be to have a fig tree in your garden! Unfortunately, nut flours have more fat and moisture, so they’re not a good 1-to-1 substitution for gf flour blend. The liquid and fat in this recipe would have to be altered and I’m not too sure by how much without testing the recipe first. You could, however, look for a good paleo vanilla cake out there on the web and use the spices, buttercream, and caramel from this recipe. Let me know how it goes if you give it a try! This looks amazing! I’m inspired by the flavor parings…Would it be possible to make this with regular all purpose flour or cake flour, and regular granulated sugar? Thank you, Betsy! Hmm, I haven’t tried it so I can’t say if a one for one substitution would work exactly. However, I do have a vanilla cake recipe made with regular flour and sugar that you could add the chai spices from this cake recipe to. (Recipe link here: http://www.wifemamafoodie.com/vegan-vanilla-cake-with-strawberry-buttercream/) You could then use the buttercream and salted caramel from this recipe to top it with. I’m sure that would taste amazing! Let me know if you give it a try! I truly would love to grow a fig tree in my backyard–now I have lemons, Fuji apples and peaches growing in my garden. It would be wonderful to make a cake with one of them! Absolutely stunning! Those figs look so perfectly ripe and pink inside. Figs are just starting to come into season here in New Jersey, and I’m book marking this to make. Maybe for my birthday in September!! Holy crap this looks SO good!! Ok, definitely need to make this. Thanks so much for sharing! that’s one glorious cake!! So pretty!! This looks absolutely incredible! And your pictures are stunning! Did you seriously make this? I’m in awe. Haha. And I love desserts with no refined sugars! This weekend I’m going to try avocado brownies made with coconut flour. Thanks for the compliment Sarah Jean 🙂 The avocado brownies sound so delish! I’ve never had a spiced cake before, but this looks tooo good!! Thanks, Emily! If you try it, I think you’d really enjoy it! It’s SO pretty. Your best cake yet! Thanks for sharing this gorgeous creation. Ah, thanks Kimberly! I’m so thankful for our friendship and your kind words! May you have a wonderful weekend as well! this simply looks incredible!! where did you find that beautiful cake stand? sorry if you’ve mentioned it before or get asked this all the time. Thank you, Samantha! I actually found it at Marshall’s. They sometimes have some cool, wooden dishes so I’m always on the lookout. Thank you, friend! I really appreciate the encouragement!